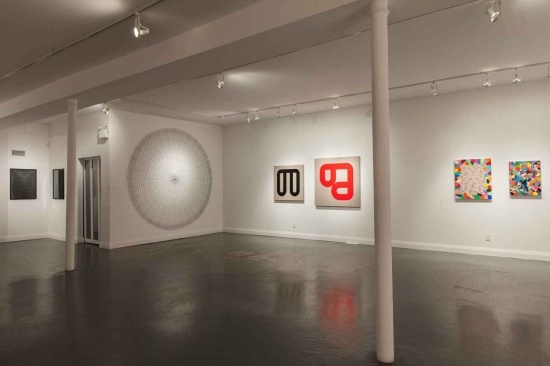 PRESS RELEASE ANGELL GALLERY is pleased to present SUPERABSTRACTION, an exhibition showcasing diverse approaches to abstract art. Featured artists are KENNETH EMIG, BRADLEY HARMS, NEIL HARRISON, DANIEL HUTCHINSON, KINEKO IVIC, DEREK MAINELLA and VESSNA PERUNOVICH. Critic and curator Robert Storr describes abstraction as “one of the great inventions of modern art," and interest in this enduring form is stronger than ever. MoMA, the Guggenheim, the Museum of Contemporary Art (LA), Musée d’art contemporain de Montréal, the Walker Art Center and the Museum of Contemporary Art in Chicago are just a few of the major institutions to recently host significant surveys of abstract art. 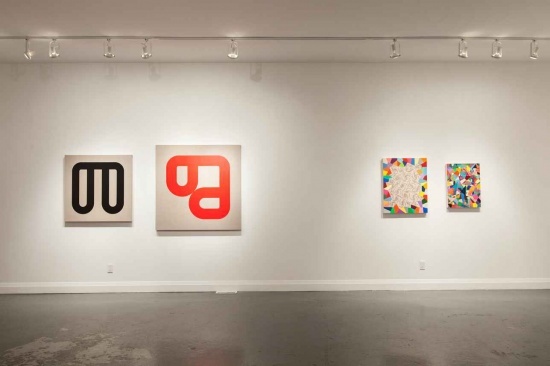 SUPERABSTRACTION presents a snapshot of how abstract art is evolving. 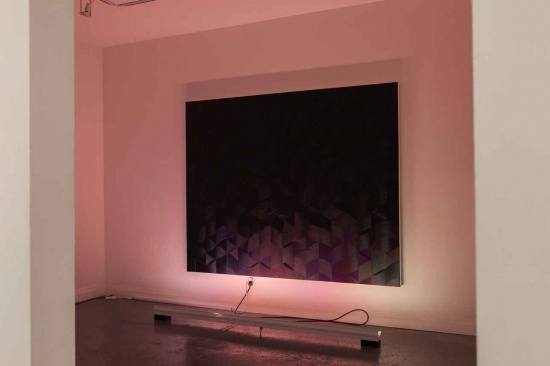 The featured artists, both Canadian and international, draw inspiration from 20th century abstraction, while embracing 21st century materials, technologies and concepts. Painting remains a mainstay, but the pervasive influence of technology has seeped into the vocabulary, surfacing alongside influences from classic modernism. 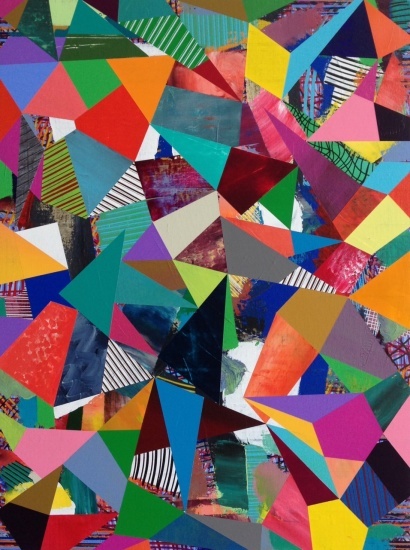 In the vibrant canvases of Bradley Harms, opaque prisms of popping colour alternate with striated elements, evoking both the ordered structure of pixels and the chaos of digital information overload. 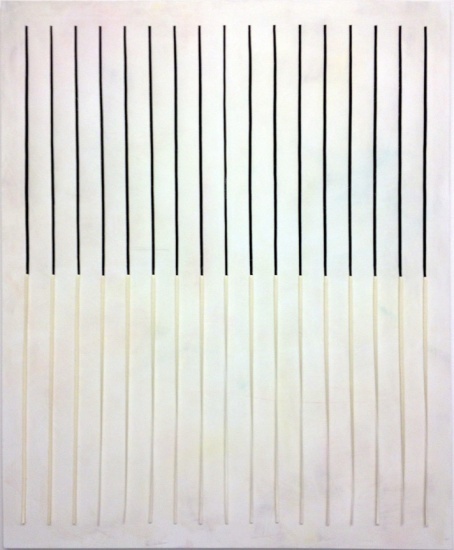 The resulting dynamic tension is shored up by Harms’ clever engineering of perceptual shifts between surface and depth. Daniel Hutchinson also looks to the wired world to inspire and illuminate (literally!) his paintings. Using software to fracture images of natural phenomena into elemental forms, Hutchinson then reconfigures these shapes in deep monochrome tones, using carefully orchestrated brushstrokes that catch the light. Custom fluorescent light fixtures illuminate some works, adding a ravishing iridescent shimmer. 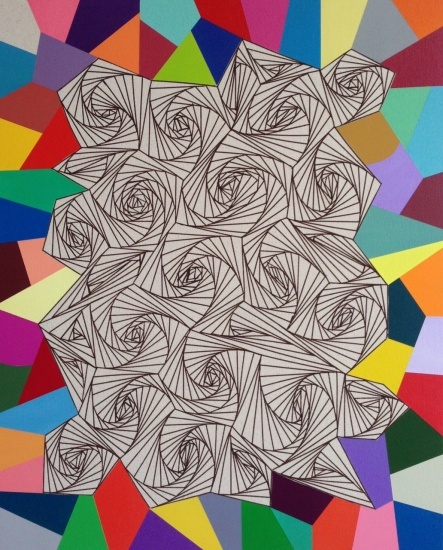 The paintings of Neil Harrison are sparingly elegant interpretations of geometric abstraction. Drawing from signs and symbols ranging from corporate logos to tantric painting, Harrison paints newly imagined figures using powdered graphite and oil paint on raw textiles. The embodied studied oppositions — negative/positive, inside/outside, familiar/new, tactile/conceptual, are held in taut suspension by a square frame. 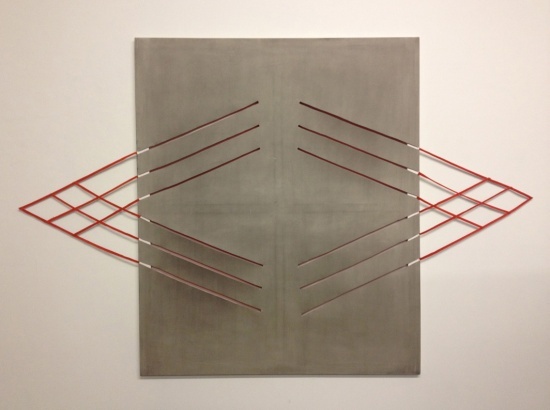 Economy of means also characterizes the painting of Derek Mainella. Updating the torn painting concept pioneered by Italian artist Lucio Fontana, Mainella strategically rips into a canvas painted a brilliant flat yellow. The torn fabric and the void it leaves behind play against the painting’s surface in a one-liner whose wit belies the simplicity of its execution. By contrast, the paintings of Kineko Ivic bristle with a richly worked raw energy reminiscent of l’art brut. Thickly textured bumps, patches, scratches and splashes sprawl and brawl across the surfaces of his paintings, in a ‘Neolithic man meets inner city alley’ mash-up. 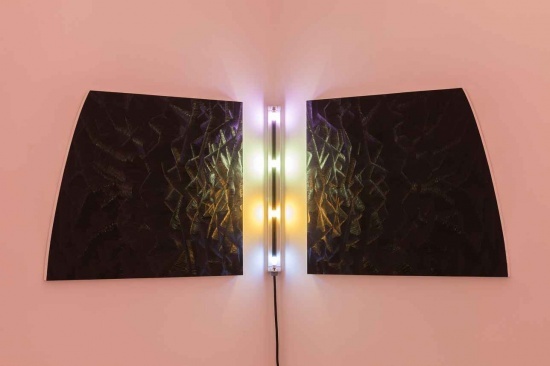 The contemporary materials palette of abstraction today is illustrated by the work of sound and light artist Kenneth Emig, whose architectural light boxes incorporate strategically placed lights and mirrors that produce an infinity of reflections. With each step the viewer takes, the glowing shapes appear to shift, resulting in an engaging 3-D update of 1960s Op Art. 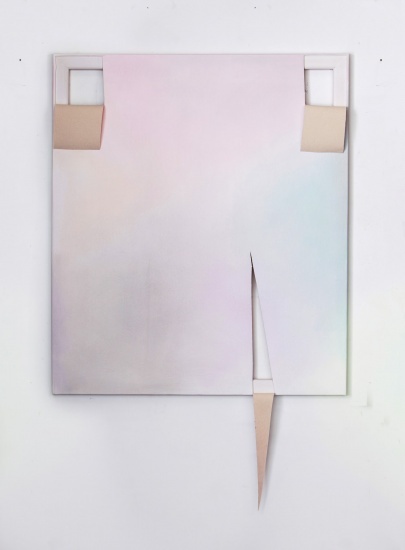 A conceptual approach to abstraction marks the work of Vessna Perunovich. Using thread as drawing material, Perunovich creates wall pieces that make meaning through form and process. Thread, a material that is fragile yet flexible, signifies human vulnerability and resilience. Laboriously manipulating thread into shapes such as the circles in Two Worlds, the artist alludes to the state of exile experienced by those forced to flee their homelands due to conflict. Artist Bios Kenneth Emig is a trans-disciplinary artist living in Ottawa, who integrates sound, sculpture, optics, dance and technology within his artistic practice. Achievements include a public art commission for the City of Ottawa, a solo exhibition at the gallery AxeNeo7 in Gatineau, Quebec, a solo dance commission for the 2008 Canada Dance Festival and a piece created for the 4th Moscow Biennale of Contemporary Art. Bradley Harms, based in Vancouver, received his MFA from the School of the Art Institute of Chicago. He has exhibited internationally, including shows in Chicago, New York, San Francisco, Miami, Barcelona, Munich, St Petersburg, Sydney, Singapore, and Tokyo. In 2013, Harms had a solo show at the Art Gallery of Windsor. His work is such collections as the Glenbow Museum, the Bank of Montreal and the Canada Council. 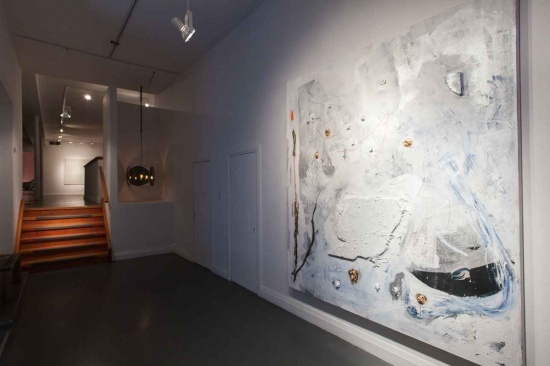 Kineko Ivic has a BFA from Ontario College of Art, and has exhibited his paintings in solo shows in Toronto and New York City, and in group shows in North America and Europe. He is also the owner/curator of Greener Pastures Gallery in Toronto. Neil Harrison, originally from Winnipeg and now based in Toronto, has a degree in Physics & Astronomy at the University of Victoria, and is presently an MFA candidate in Drawing & Painting at York University. He has been in numerous exhibitions in Toronto and Montreal. He was a finalist in the 2013 RBC Painting Competition. Daniel Hutchinson received his BFA from the Emily Carr Institute in Vancouver and his MFA from NSCAD University in Halifax. Twice named a semi-finalist in the RBC Canadian Painting Competition, Hutchinson shows internationally, and was in The Painting Project at L'Université du Québec Ã Montréal, Imagining Disaster at Museum London, and solo shows at YYZ and Angell Gallery in Toronto. Derek Mainella is a curator and multi-disciplinary artist based in London, UK. 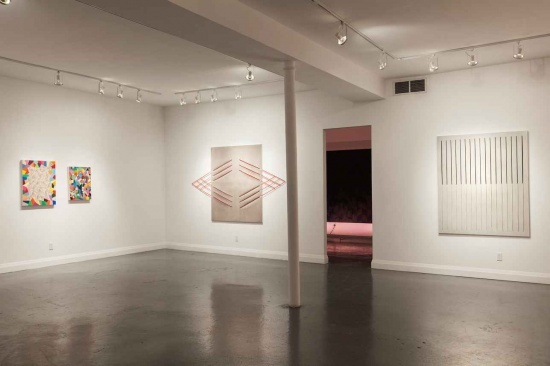 Mainella has had several solo exhibitions, and has appeared in group shows and art fairs in New York and Europe. In 2103 he curated and exhibited in ARE YOU ALRIGHT? New Art from Britain, at Museum of Contemporary Canadian Art (MOCCA), Toronto. Mainella’s work is in private collections in North America and Europe. Vessna Perunovich is a Toronto-based internationally acclaimed interdisciplinary artist whose work embraces performance, video, sculpture, painting and drawing. 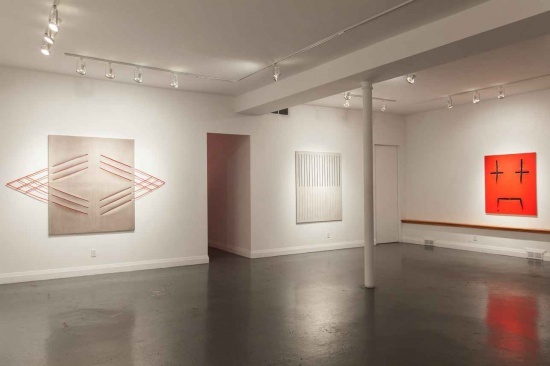 Perunovich has exhibited and attended residencies throughout Europe and North American, including touring survey exhibitions Borderless and Emblems of Enigma. 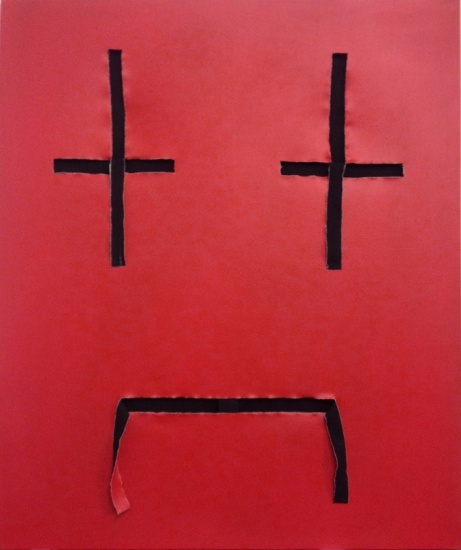 A recipient of the Toronto Friends of Visual Arts, Perunovich is represented in many collections, and is the subject of two monographs: (W)hole, 2004 and Emblems of the Enigma, 2008.